Our signature one‐day girl‐focused event demonstrates the fun in science through hands‐on workshops and activities run by volunteer role models in STEM fields. These are events open to the local community and brings 200+ attendees with up to 100 volunteers/workshop leaders per event. We organise these events in 5 continents across the globe, and with our growing partnerships and sponsors, we often get the question... where next? You tell us! Take a look at our upcoming events page - join us for an existing event or lets create possibilities together! Here are where some of our conversations are taking us: Morocco, Dresden, Cincinnati, Pittsburgh, Thessaloniki, NYC, Sicily, Dubai, Costa Mesa, Belgrade, Raleigh, Mexico City, Vilnius, Barcelona, Istanbul, Saudi Arabia, Oman, Kuwait, Chennai, Sofia, China, Korea & Taiwan! Curious? Contact us for more info! Greenlight for girls launched its flagship g4g Day event in Brussels and we've hosted it annually ever since at the beautiful facilities offered by our partners at the International School of Brussels. After years of experience, the girls keep coming for more, volunteers are increasing in size and we strive to make each event better than the last! If you are interested in participating, volunteering or partnering with us please do contact us, we may even get a visit from Albert Einstein again! Visit the Gallery Tab for pictures from all our events in Brussels. Read our blog post from g4g Day@Brussels 2014. Messy science is the best kind! The first ever launch of g4g Day in the Middle East! Read the press release and our blog post from the day. Visit the Gallery Tab for pictures from all our events in Europe and check out the great press we got In the News. Learn more about our 2013 Greek launch with our blog post on g4g Day@Athens 2013. Visit the Gallery Tab for pictures from all our events in the US. Read our blog post about g4g Day@SouthCoast 2015 and 2013 press release. Launching in the Democratic Republic of Congo, g4g Day@Kinshasa 2011! Read our press release. Visit the Gallery Tab for pictures from all our events in the Congo. In 2012 we launched our first g4g day in Brazil! Read our blog post from g4g Day@OuroBranco 2013 and visit the Gallery Tab! getting silly with the Ouro Branco greenlight girls! Watch the video launching our first g4g Day in Brazil! 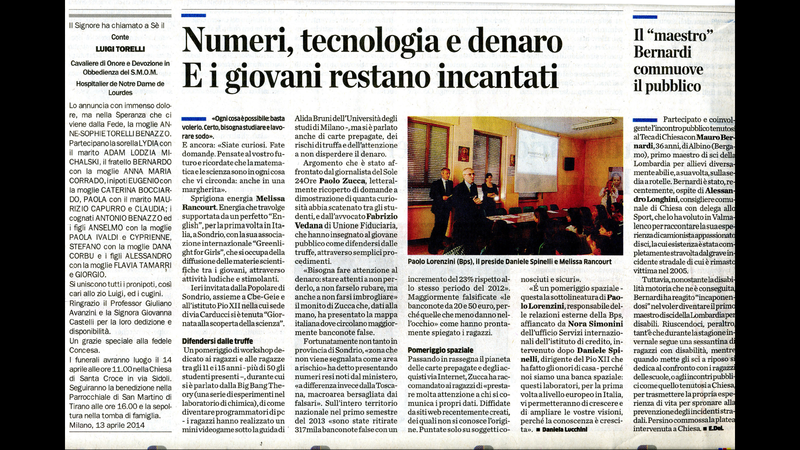 We launched in Italy in 2014 with g4g Day@Sondrio. Check out what the press had to say here and here! Science is all around us, but especially on our labcoats! g4g held its first g4g Day@ESMOL, Belgium on the 24th November 2012 after attending the Mol Open Door day earlier that year. Read our press release! Visit the Gallery Tab for pictures from all our events in Mol. Future professional molecular biologist in the making! g4g inaugurated it's first-ever Danish event, g4g Day@Odense, on 21 April 2012. Check out an external blog post about the day.